Inshore water temperatures on the north end of the Grand Strand have dropped to 46-48 degrees. Clarity is back to winter normal. Water temperatures have dropped in the last week to ten days, but not enough to run the trout off. 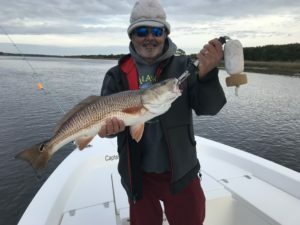 Captain Patrick “Smiley” Kelly (843-361-7445) reports that they are still catching fish out at the jetties as well as inside in the Intracoastal along ledges in 5-10 feet. Live finger mullet have been working well, with the best action usually on the rising tide but some fish also being caught on the incoming. Colder, clearer water is a mixed blessing for redfish, as the fish are a bit less aggressive but much easier to see. Sight fishing the low to rising tide is the best time to targets reds that have generally been slot-sized and above. In addition to flats fishing, fish can also be found in the creeks around oyster beds and docks. Artificial baits like Vudu Shrimp, Gulp! baits in New Penny, and mud minnows fished under a popping cork have all been working. There is still a good bite for smaller black drum, although some of the fish are keeper-sized. On the ledges fish can be caught in about 10 feet of water on small pieces of cut shrimp. Cherry Grove Pier (843-249-1625) reports that surf temperatures have dropped to around 53 degrees and the catch has become limited to a few whiting and black drum.